V1698. 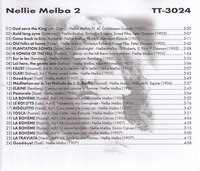 NELLIE MELBA, Vol. II, incl. Songs by Bach-Gounod, Bemberg, Bishop, Ronald, Gatty, Barnard, Foster, Bizet & Tosti; Arias from Clari, Elaine, Faust, Le Roi d’Ys, La Traviata, Rigoletto & La Boheme; w.Enrico Caruso: La Boheme – O soave fanciulla. (Germany) Truesound Transfers 3024, recorded 1905-07, London & New York. Transfers by Christian Zwarg. Final copy!